Pleasurable Hobbies: How to Keep My Bouquet Fresh until the Wedding? A bouquet of wedding flowers is a very important aspect of the wedding ceremony, whether it is a grand celebration or an intimate gathering of a few family members and close friends. Bridal bouquets play an integral role in the celebration and has been a tradition for centuries. A wilted or drooping bouquet of flowers is a genuine fear for any bride who is preparing for her big day. However, flowers that are properly prepared will last throughout the ceremony, the photo session and wedding reception. When appropriately stored, the bouquet will remain fresh for a minimum of 12 hours. Choose flowers that have sturdy stems such as carnations, roses, lilies, peonies and hydrangea. Purchase between 8 and 12 fresh flowers to make the hand-held wedding bouquet. After processing the flowers, place them into a container of water that is clean and sterile. Use a flower sealant to spray the blossoms as an added method of keeping the flowers fresh. Choose three blossoming flower stems of the same height and use floral tape to wrap around them, covering 1 or 2 inches of the stems. Ensure that the tape is placed approximately 4 inches below the blossoms. Put between 3 and 5 more flowers at the sides, ensuring that they are slightly below the center blossoms and use the tape to keep them together. This will give the bouquet a slightly rounded appearance. As an option, sprigs of ivy, statice, smilax, leather leaf or baby's breath can be added to the outer edges and taped into place. 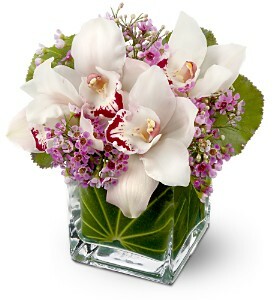 Place the bouquet into a container of 2 to 3 inches of water in order to keep it fresh. Use floral sealant to spray as an optional boost. A few hours prior to the ceremony, use appropriate colored ribbon to wrap the entire length or a section of the stems. Use corsage pins or hot glue to secure the end of the ribbon in place. Keep the stem hydrated by allowing them to remain in water until close to the time when the bouquet will be taken down the aisle. Prior to the wedding, store the wedding flowers in a cool room and keep the bouquet from freezing temperatures or heat sources. Avoid using your fingers to touch the blossoms as this will prevent bruising and handle the bouquet with great care. On the bridal table, strategically place a decorative vase with about 3 inches of water to place the bouquet of wedding flowers for the duration of the reception. The wedding bouquet will serve as a centerpiece, which looks quite stunning and remains fresh and hydrated. Sam Moser is a freelance content writer who has written almost exclusively for the web since graduating from the School of Journalism at Ryerson University in Toronto, Ontario. For him, who has been attending different wedding ceremonies, nothing beats the Mississauga florist in flower arrangement. Once in a while I buy flowers for home decor, and it looks like, these tips are also applicable. These tips are also good if you love to have flowers in your home. I often cut the flower stems each day to prolong its life. Thanks for sharing these trivia, Sis Rose. I will surely help those who are planning to have their wedding especially during summer time. My mom always makes sure that she buys new flowers every week. She usually does it every Sunday after attending the mass. Thank you for sharing the tips :) I'll let her know about these. Good tips, my wedding bouquet was just ordered so I don't know what they do but as far as I remember it stays one week eve the flowers that was decorated in our wedding. These are great tips for all brides especially those who prefer to make their own wedding bouquet. These tips are useful as well for those who wish to preserve the freshness of their flowers a little longer. definitely great tips on how to keep flower bouquet fresh and last a little longer. these are useful tips not only in weddings but in any ordinary day where you have to keep the flowers fresh. Good tips to remember to keep flower cuts fresh . I also add, a tablet of paracetamol sa water. It helps talaga. A bouquet of wedding flowers is a very important aspect of the wedding flowers perth, whether it is a grand celebration or an intimate gathering of a few family members and close friends.